With 30 years of experience working at and owning several types of agencies, there is a lot of experience to share. Jim has spoken and served on panels at many creative events. From educating clients on how important creativity is to their business, to sharing stories of the journey. In his career, Jim designed and implemented large tours for the motorsports industry, launched a record label, published a children's book and braved the transition from agency owner to a consultant. His latest agency's work has been featured on Adobe's Behance Network, The Dieline, among others. 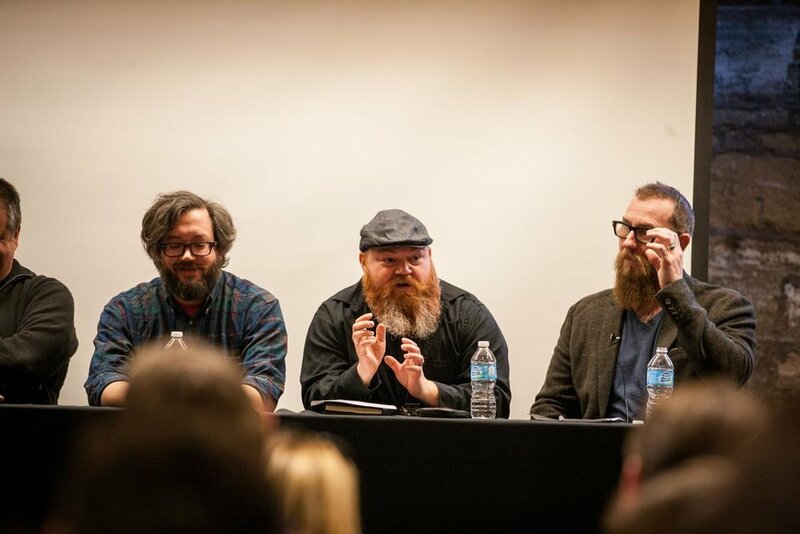 He's been on panels at AAF - Ad Club St. Louis, St. Louis Design Week and AIGA's Bright and Early talks at the Regional Art Commission. He's spoken at several universities on design, and served on the advisory board at East Central College, as well as taught as an adjunct professor at Southern Illinois University at Edwardsville. He's been a guest on several design podcasts, some which are available to listen to below. Jim loves sharing his stories with businesses, students and fellow designers & creatives. STLDW 2015 Panel - American Dreams: Where did your Passion Path Lead You? Hired during the dot com boom 25 plus years ago, Jim Harper was the 75th hire out of 350 people to help The Zipatoni Company tackle a 22 million dollar a year client, Miller Brewing, and then shortly after that, Bacardi Spirits. Within 5 years he went from digital artist to a senior creative, and helped sell a huge Mardi Gras campaign that ran for several years. Since then, he’s led creative at 3 other agencies as ECD, until owning his own agency, Boxing Clever in St. Louis, which grew from 7 people to 30 during his tenure. For 12 years, Boxing Clever did award-winning creative work, published books with celebrities, started a record label, manufactured skateboard decks and did everything an agency could dream of. Three years ago, Jim sold his shares of the company to his business partners, and moved closer to home to be closer to his family, and moved into a small office in downtown Edwardsville, IL to work independently. Since then he has started the ball rolling again branding spirit and CPG products, as well as helping launch new brands and perform re-brands in several sectors. Future plans include continuing his 30-year career of completely uninterrupted work. 30 Year Ad & Digital Veteran leading a creative team with focus on Branding. Digital & Sales Promotion. The last few years he’s focused on branding/re-branding and product launches. Extensive work in content creation for many brands including major growth of brands in consumer categories. Last year JHC created, sold and helped implement 1.2 million in social content for Monsanto with PR partner Weber-Shandwick's St. Louis office. In the past 2 1/2 years JHC has built and launched 43 Websites for clients. 80 percent of those clients were also branded as well in the process. Sectors include: Spirits, Medical/Pharmaceutical, Food, Health & Fitness, CPG, Education, Cannabis, Technology, Fashion. If you aren interested in having Jim speak at your event, conference, company or school, use the contact form and let's start the conversation.